Stonehenge and the Ice Age: New paper on the Altar Stone -- or is it? New paper on the Altar Stone -- or is it? The six-tonne recumbent Altar Stone is perhaps the most enigmatic of all the Stonehenge bluestones, differing markedly from the others in size, tonnage, lithology and origin. It has therefore had more than its fair share of speculation on all of these aspects and many questions remain: was it always recumbent, was it a singleton or half a twin, where did it come from? Clearly it is not from the Preseli Hills hence the debate as to its geographical origins for over a century. However, any provenancing of the Altar Stone must rely on a detailed and accurate lithological and petrographical description. New descriptions of material labelled ‘Altar Stone’ held in museum collections and a re-evaluation of suggested Altar Stone debitage using automated scanning electron microscopy and linked energy dispersive analysis using QEMSCAN technology suggests that modification of the published petrographical descriptions is needed. A new ‘typical Altar Stone’ description is provided including the presence of early cementing barite and a better characterisation of the clay content. These new data should continue to narrow the search for the geographical origin of the Altar Stone, one that is expected to be at the eastern end of the Senni Formation outcrop, an outcrop that reaches as far east as Abergavenny in the Welsh Marches. When Ixer and Turner published their "definitive" paper on the Altar Stone in 2006 they were criticised for assuming that "sample 277" was from the only reliably provenanced piece of Altar Stone available -- and for assuming that in describing its characteristics they were describing the true characteristics of the Altar stone and its petrography. They said at the time: ".........the thin section labelled ‘277 Altar Stone Stonehenge’ in the Salisbury Museum Collection is likely to remain, for the foreseeable future, the only piece of the monolith available for investigation. It is imperative then that it should be described as fully as possible and that this description becomes widely available." This last sentence contains the justification for the writing of the paper. This paper represents the first detailed description of the Altar Stone for over eighty years and is in broad agreement with H.H. Thomas other than his identification of abundant garnet and glauconite. Glauconite is a green, chlorite-like mineral and so, if present, has been subsumed under chlorite in the present description. The disparity over the amount of garnet is more significant and puzzling. Thomas noted significant amounts of garnet in his ‘heavy residues’ (Thomas, 1923, 244) but did not report garnet in his thin section description of the Altar Stone. Although trace amounts of garnet can be overlooked/underestimated in thin section the present study could not confirm significant amounts of garnet microscopically. The presence and amount of garnet is important as Thomas was struck by the coincidence between the garnet-rich nature of his Altar Stone ‘heavy residues’ and the unusually garnetiferous nature of the Cosheston Beds and it was the presence of these unusual amounts of garnet in both, that led him to suggest the Cosheston Group might have been the origin of the Altar Stone. Without further sampling (this would require many grammes of Altar Stone to crush before separating the heavy minerals) the garnet problem must remain unresolved. The big issue here is the amount of garnet among the heavy minerals in the rock. Herbert Thomas and Richard Thomas have both stated that there are substantial amounts of garnet in the Altar Stone itself -- but garnet is missing from thin section 277. There are also substantial amounts of garnet in the Cosheston Beds. So was HH Thomas right all along? And have Ixer and Turner simply assumed that thin Section 277 was correctly labelled, when it might have just come from a piece of debitage assumed -- unreliably -- to have come from the Altar Stone? So in 2006 there was a muddle, and the muddle has got worse since then, with arguments not just about the labelling of so-called "Altar Stone" samples, but also about the ownership of the samples and the thin sections taken from them. English Heritage could, of course, sort the whole thing out right now by giving permission for a small sample to be taken from the stone -- but they presumably would prefer for as many Stonehenge mysteries as possible to be kept alive and unresolved! So, in attempting to make the best of a bad job, Ixer and Bevins and their fellow authors have tried to draw together as much material as possible into this new paper. Was it worth the wait? Have we now got the answers? Twelve samples from fragments have been examined during the present study -- including some collected during the Darvill / Wainwright excavation of 2008. A number of different methods were used on all of the samples so as to permit strict and reliable comparisons. In describing previous studies (of which there are many), the authors have to admit that all of the samples studied in the past have suffered from the lack of certainty about any links they might have with Stone 80 which lies there today, peacefully embedded in the ground and trapped beneath those big sarsens. The bulk of the paper consists of sample descriptions and analyses -- all very carefully done. Then we come to the discussion. The authors admit that there is no confirmed relationship between the Altar Stone and any of the debitage or the examined samples -- and they say: " Rhyolitic/dacitic standing orthostats SH 38, 40, 46 and 48 have little or no recognised debitage and this is true for the Altar Stone. " They go on to say that there are great similarities in the characteristics of most of the 12 samples analysed, and they then take three "altar stone samples" (why do they refer to them as such?) from the 2008 excavations as probably being REALLY representative of the Altar Stone -- choosing sample 08/196 as the "type sample." They suggest that this is a better type sample than sample 277........ which "may be atypical". The issue of the abundant garnets in the heavy mineral assemblage is mentioned but not properly addressed. All in all, this is a strange paper. There is no new fieldwork here, and no new sampling of the Altar Stone. It's good to have all these samples examined, described and compared, but since not one of them is properly provenanced to the Altar Stone itself, there is a degree of futility in the whole exercise. And the authors themselves get into quite a tangle, sometimes stressing that they are NOT describing the characteristics of the Altar Stone, and sometimes pretending that they are. So we are a bit closer to knowing where some of the debitage might have come from, but no further advanced than we were before in establishing the origin of the Alar Stone. 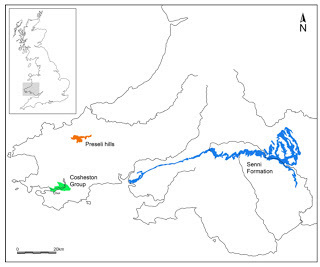 There is another paper to come: The relationships, or rather the lack of any, between sandstones found within the Stonehenge Landscape (Altar Stone and Lower Palaeozoic Sandstone) and the Devonian rocks of the Milford Haven area (Cosheston Group) area are being explored, in detail, in a companion paper. That will be designed to demonstrate that the Cosheston Beds link is now discredited, but since the new paper will also be hindered and devalued by the lack of any new work on the Altar Stone itself, I don't expect much in the way of enlightenment. The object of the exercise is clearly to establish the eastern exposures of the Senni Beds as the place where the Altar Stone came from, because that is what happens to suit the latest MPP hypothesis, but I fear that my scepticism about all of that is just as great today (after reading the new paper) as it was yesterday. You say it is a strange Paper. I find it equally strange that you have obtained sight of a pre - publication Paper. Very strange! So some geologist makes friendly contact with a geomorphologist. Wow! The one mentioned here took a long time to publish as there were any number of sticking points to be considered between authors. But in this case at least, the version on Acedemia is virtually identical to the one sent to the printers. For the record, it's a good paper and long overdue. What's the problem with naming names, Neil? There is nothing secretive or confidential about pre-publication papers appearing on Academia -- if it is placed there, presumably it is with the agreement of all the authors. So who cares who put it there? Not me. Same with papers on the Quaternary, from all the big journals. I was speaking in terms of pre-pre-publication. This paper, for example isn't slated for print till next summer, but everyone's read it on Acedemia. It was written in August. The problem with naming names is two-fold. 1). I will have promised to keep my mouth shut. 2). Some of these folks would rather not let it out that a nobody like me has read their stuff before it's released. Personally, I prefer pre-pre-pre-publication. Where will it all end? Seriously though, any academic author worth his/her salt will show a paper to selected advisors for comments before finalising the draft and then getting it into the submission / peer review cycle. Which is why I am completely gobsmacked that those two appalling Antiquity papers by MPP and his merry gang ever made it into print. Did NOBODY scrutinize them, at any stage.....?? This Blog concentrates on matters relating to Stonehenge and the mystery of the bluestones. It is NOT an archaeology site, and I will try to keep all entries accurate and science-based. All comments are welcome, although I reserve the right to terminate discussions if I feel that they are getting nowhere! Also, please note that I will not accept Anonymous or "Unknown" posts -- the spam filters are set to dump those straight into the rubbish bin. So if you want to contribute, please use your name or a pen name. I'm a native of Pembrokeshire. I read Geography at Oxford University prior to working in the Antarctic for a while and then I spent 11 years teaching geomorphology in Durham University. In 1976 I moved back to Wales with my wife and family to a smallholding -- where we set up two small businesses, my wife as a candle-maker and I as a writer and publisher. We have been at the same address now for 43 years. We couldn't live anywhere more beautiful. We have two sons and two grandsons. Apart from my great interest in Stonehenge and the bluestones, and local prehistory and folk traditions, I also write fiction -- and have now written eight volumes in the Angel Mountain Saga -- all tales about a feisty and imperfect heroine called Martha Morgan, who lived on the flanks of Carningli -- the mountain which lies between my home and the north Pembrokeshire coast. The Neolithic Revolution came from the east, and then was ended from the east. The hunt for Proto-Stonehenge and the bluestone quarries has been abandoned? When is a till not a till?